We had a splendid boattrip (6d/5n) and were thoroughly satisfied. From the pick-up at the hotel till the drop off 6 days later we were perfectly cared for without hidden surprises. Easy visa arrangements on the spot from Ranong and a good boat transfer to Kawthaung. The food was great, as we had already been told. Na is a great cook. We enjoyed a fantastic cruise (3d/4n) on the Y Not with another couple. As a pair of biologists, and boat owners ourselves, we are difficult to impress, but I can't say enough about the magnificent Mergui islands and the marine life. It was like swimming in an aquarium! We experienced perfect service, with Eric at the port resolving issues to ensure nothing spoiled our vacation, to Captain Michael who took us to the most amazing places, and our guide Hein, to the best chef ever Kayan. The experience, the company, the landscape, the food... all made for an absolutely perfect vacation. We will definitely visit the Mergui again, and will certainly sail again with Burma Boating. Thank you! The most amazing adventure, bounty islands popping up in the horizon one after the other, with nearly untouched long white sand beaches. Perfect snorkeling, with the most beautiful and untouched coral reefs. AK and the crew, where excellent, always prepared to make our stay perfect in any way. The chef onboard, made the most fantastic food, fresh seafood directly traded from neighbor sailing fishermen and our captains self caught king mackerel, yummy. We feel very lucky to have spend the most fantastic days together with some amazing interesting people from around the world (we were 7 nationalities onboard) together with the crew and the amazing surroundings, that made this journey the most memorable journey we have had yet, THANK YOU!" "Burma Boating is a well organized company. You get fast reply an all your queries already during the booking process. All transfers and arrangements were organized pretty well. The sailing trip is a great experience in a fantastic nature without many other tourists. Snorkeling is very good and the beaches and the small islands are a perfect spot to relax. The crew is great and always and take care of the guests. Always in a good mood and always helpful to make this trip to a fantastic experience. The food is excellent and with a big variety of different dishes. I would definitely recommend this trip and considering going back next year with full family. Thanks to all who made this trip so memorable." "Thank you all for everything. You have shown us an amazing secret part of the world. The snorkeling was the best we have experienced. The boat was very comfortable and the food terrific! The crew made us feel welcome and at home. An amazing Trip! Thanks." "Discovering the Mergui Islands, the Moken population....lights years away from the standard cruises, hard to find..well here it is ! A real exploration vessel offering the highest confort and safety, leading you to the most remote tourist-free places in the Andaman sea is a unique opportunity to live a dream ! Certainly my best experience ever, I'm happy to have it done in my top bucket list :) "
"It has been a huge pleasure to join the Meta IV for a 6 days boat trip in the Mergui Archipelago. We have really enjoyed life aboard and experiencing this paradise on earth. The crew has been amazing and made this experience even better. We have especially enjoyed the food, the sunsets and the snorkeling. Thanks to the crew to share his knowledge about Moken people and the wildlife." "Seven of us just spent 5 nights on Meta IV, celebrating my 60th birthday. We couldn't have asked for more - it was a fantastic trip!! The crew is superb and the food beyond delicious - we all wanted to bring Tim home and have her cook for us full-time. We were completely spoiled by the whole crew! Meta is a beautiful, luxurious boat and no detail is forgotten. 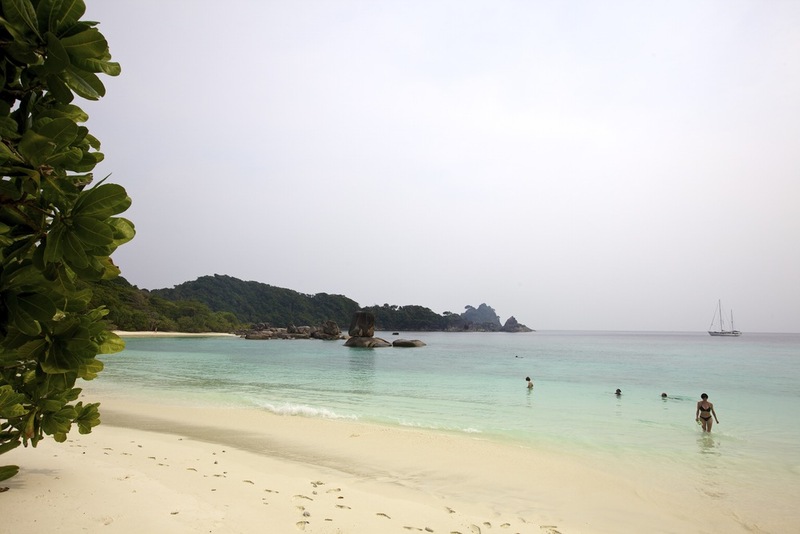 Couple that with the unspoiled beauty of the Mergui and all its pristine beaches.....a vacation beyond belief!" "We have sailed with a great crew on the most pristine and remote islands I have ever seen. Pampering you like a princess, Burma Boating makes your dream come true." "We had a terrific experience with Burma Boating. We were looking for destinations for our honeymoon online and found the website. From our very first interactions with the Burma Boating team in figuring out how this trip would work and whether it would suit us, we had a great experience. They were very helpful and even went so far as to help us plan the rest of our trip after the cruise. Once we got to Ranong to take a long tail to the yacht, we faced some issues with the Thai visa authorities. However, the Burma Boating team helped us sort everything out quickly and efficiently. The Raja Laut itself is a beautiful yacht and our time spent on this trip was absolutely amazing. We discovered the joy of sailing and the comforts of a well-appointed boat. However, it must be said that what made the trip truly exceptional was the captain and crew. We left ourselves completely in their hands, and they made sure that every moment of our trip was an absolute delight! They had a detailed itinerary planned and we loved every bit of it. We were wined and dined at an almost five star level and that was one of the best surprises they had for us. Thanks so much to Burma Boating and Raja Laut crew for making this trip perfect!" "One of the best cruising experiences of our lives worldwide. The Mergui is a pristine and undiscovered place to cruise and you can't find a better crewed charter team than Burma Boating. My wife never lifted a finger and the crew and guide were the most responsive team we have ever had on a charter. You cannot go wrong with this crowd. We swam, snorkeled, and visited the Moken people. The local fishermen and their families were welcoming and the birding was fun. We recommend that anyone visiting Myanmar take the time to go south and spend a week with these guys. Once in a lifetime cruising experience!"